• Most animals, except humans, primates and guinea pigs, can make Vit.C in their bodies and don’t need to ingest it for survival like we do. • Vitamin C’s role in producing collagen (the connective tissue between bone and muscle a) means it is good for the skin and also for wound healing. • Ongoing research is looking to see if Vitamin C, due to its antioxidant activity, helps prevent or delay the development of certain cancers, cardiovascular disease, and other diseases in which oxidative stress plays a causal role. • By eating sufficient amounts of a variety of fruits and vegetables daily you will most likely get enough Vitamin C.
• When in season (Oct-May), have a California Kiwi a day! For added fiber, try eating the entire kiwi- skin and all (scrub lightly and chop off top and bottom nub). • Add ½ cup of raw red peppers to your sandwich or salad. • For dessert, try 1 cup of fresh strawberries with low/no fat vanilla yogurt on top (3 oz). • Eat lots of fruits and vegetables and be sure to add variety (think rainbow). 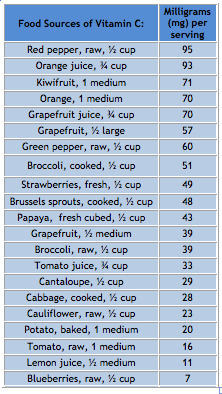 • Some Vitamin C is lost when vegetables are cooked in the water, so steam lightly or microwave to reduce loss. Be sure to eat some vegetables in their raw form as well. After a 15 hour travel journey yesterday with planes, boats and automobiles and little sleep, I was feeling a little under the weather this morning. Thought I would share some immune boosting foods I will be adding to my diet today/this weekend to ward off any sickness. I personally also like to OD on warm liquids like tea and soup and eliminate dairy if I am feeling at all sickly. Vitamin C is one of the best-known immune supporting vitamins! It is found in most fruits and vegetables but in highest amounts in green peppers, citrus fruits and juices, strawberries, tomatoes, broccoli, turnip greens and other leafy greens, sweet and white potatoes, and cantaloupe. Other excellent sources include papaya, mango, watermelon, brussels sprouts, cauliflower, cabbage, winter squash, red peppers, raspberries, blueberries, cranberries, and pineapples. Vitamin A helps maintain vision and supports the immune system. It is found in liver, milk, eggs, carrots, sweet potatoes, spinach and certain fortified foods and beverages. Vitamin E helps protect our hearts and immune system. It is found in nuts, like sunflower seeds, almonds and hazelnuts, leafy greens and in oils, including soybean, olive and canola oils. Vitamin D has also been shown to help support the immune system and is primarily obtained through the skin after exposure to sunlight. It can also be found in oily fish such as salmon, mackerel, and sardines, and also in certain fortified foods, including yogurt, milk, certain cereals, some mushrooms (!) and juices. Supplementation may be necessary for those who live in the North or don’t get much direct sun exposure (eg. sunblock). Vitamins B6 and B12 also help maintain healthy immune function. B6 is found in beans, nuts, legumes, eggs, meats, fish, whole grains, and fortified breads and cereals. B12 is found in eggs, meat, poultry, shellfish, milk, and milk products as well as fortified nutritional yeast. Vegans should supplement with B12. Selenium has been shown to support immune function. Plant foods, such as vegetables, are the most common dietary sources of selenium. How much selenium is in the vegetables you eat depends on how much of the mineral was in the soil where the plants grew. Fish, shellfish, red meat, grains, eggs, chicken, liver, and garlic are all good sources of selenium as well. Meats produced from animals that ate grains or plants found in selenium-rich soil have higher levels of selenium. Brewer’s yeast, wheat germ, and enriched breads are also good sources of selenium as is my person favorite- the brazil nut! Two a day gives you all the Selenium you need. Other anti-inflammatory foods that may help with the immune: Curcumin (Turmeric), Garlic, Wheat Grass, Chlorella, Kelp, Spirulina, Maitake and Reishi mushrooms. Pre and Probiotics help keep your gut’s “good bacteria” up which crowds out opportunities for bad bacteria. Did you know that most of your body’s immune system is in your gut! Keep it healthy by eating fermented foods like kefir, yogurt, live cheese, live sauerkraut, and kimchi (probiotics) and prebiotics like whole grains, honey, strawberries and soy which ”feed” the probiotiocs. During cold season especially, don’t underestimate the importance of sleep, washing hands, and exercise to boost your immune system and overall health. 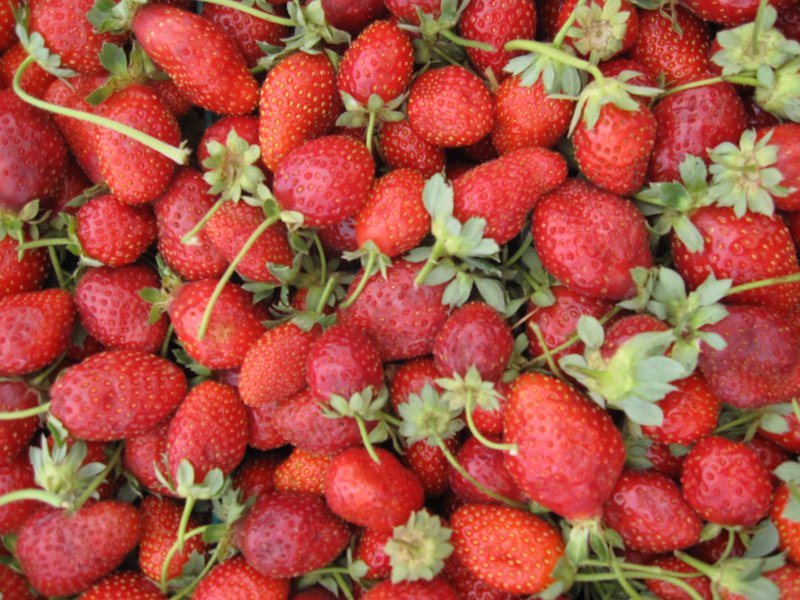 Eat strawberries (fresh or frozen) to boost your Vitamin C intake!